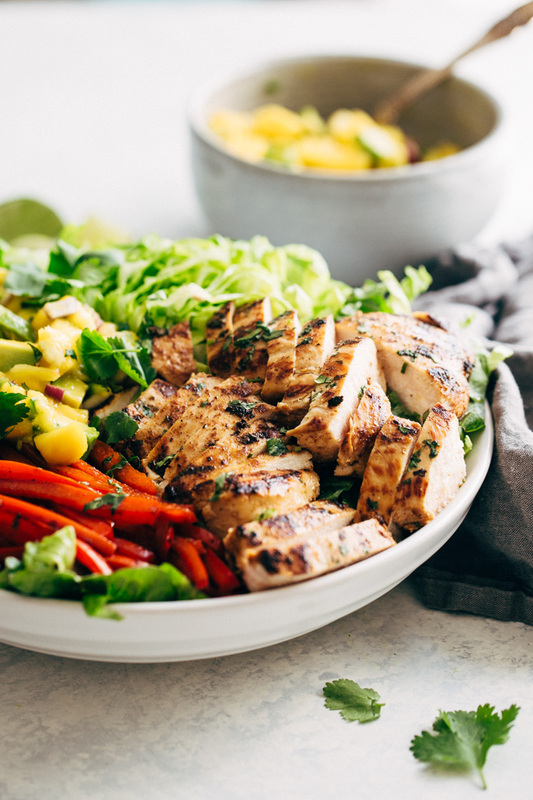 A light and healthy chili lime chicken salad with a mango and avocado salsa. We’re skipping the dressing on this salad and topping it with homemade sweet and spicy salsa. It’s the most addicting salad you’ll ever have! Chicka Chicka Chili Lime Chicken Salad! Happy Tuesday friends! 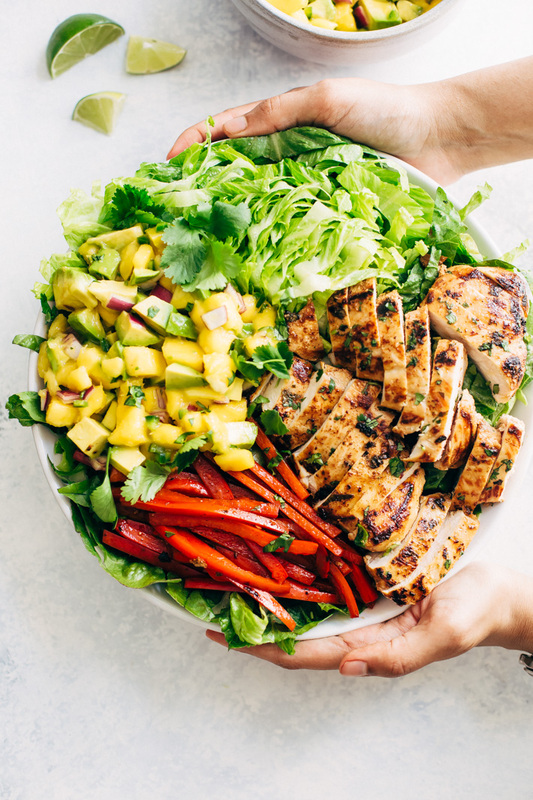 Today i’m bringing you the salad i’ve dangled in front of you at least 5 times on Instagram – my chili lime chicken salad with grilled peppers and mango avocado salsa action. Let’s really think about this for a second. 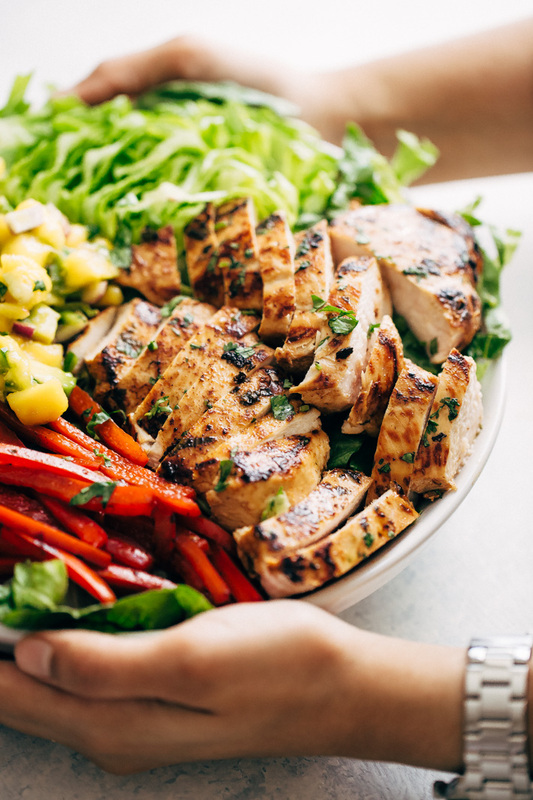 Tender grilled chicken with a bit of tangy heat meets sweet, juicy mango chunks with buttery avocado, a hint of red onions and a pinch of minced jalapeños and a handful of chopped cilantro for that beloved freshy freshness. Friends, this is my all time favorite salad dream brought to life. I kid you not, this is a WEEKLY staple in our house. 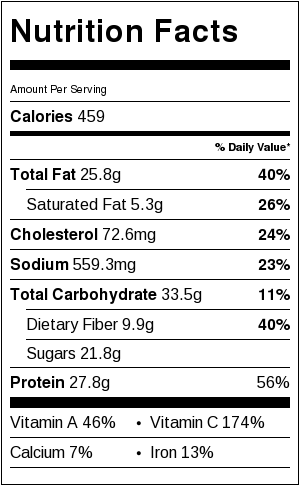 What I love about this chicken salad is that it defies the general norms of a salad. <– And let’s face it, that’s kind of my favorite thing to do. We’re REAL people who want more from a salad than just the leafy greens. That means, we’re skipping the dressing, marinating the chicken in a chili lime marinade and then topping SALAD with homemade mango avocado SALSA. You should never, ever go to Salata with me. Don’t do it. Most people point out what they want for toppings, I on the other hand, choose to call out the one or two that I don’t because if I did it the other way around, we’d all be there forever. I’m soooo not kidding about taking my salads seriously. 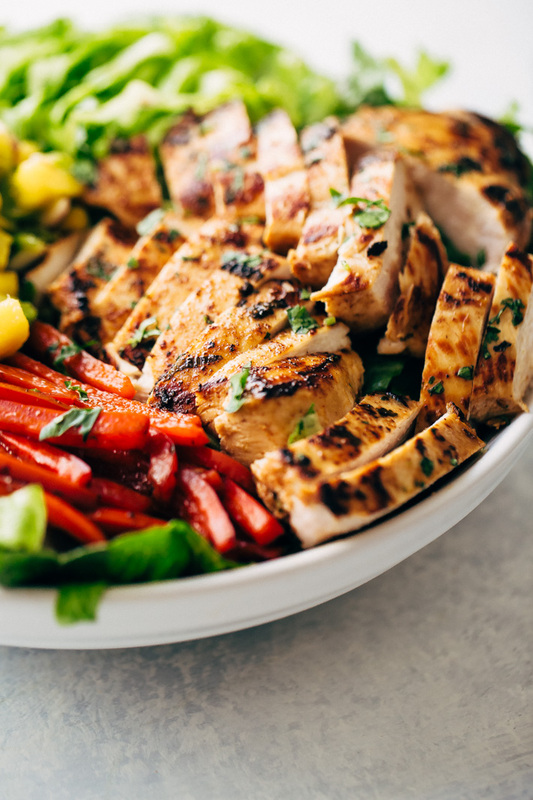 This salad is heavily inspired by a local eatery here that makes a fajita chicken salad topped with grilled onions and peppers and house-made salsa. We’re reworking it a little to incorporate plump, sweet mangoes and diced avocados — because what is a salad without avocados? In fact, what is anything without avos? Let’s start with the marinade for the chicken. We’re using a little lime juice, olive oil, garlic powder, chipotle chili powder, cilantro, and salt and pepper. Let it all hang out for 20 minutes. Then just cook the chicken in a pan or grill it! Let it rest before you chop it and toss it. For the peppers, I like to add them to the same pan I cooked the chicken in. This lets them pick up all the little flavor bomb bits the chicken left behind. Totally doable, right? And if you’re skeptical about mangoes and avocados to make a salsa, well friend, make some and grab yourself a few tortilla chips and go to town. The sweet mangoes, ripe avocados, and that tanginess from that lime juice will have you going back several times for another hit. If you’re like my husband and live for crunchy croutons or other crunchy salad toppings, might I suggest a handful of crushed tortilla chips to finish off the salad? He calls them ‘the crunchies’. You know those bits at the bottom of a bag of T chips that are kind of just there taunting you because they’re too small to dip but large enough where you don’t feel right tossing them out? THOSE. They’re there for the sole purpose of adding crunchiness to chili lime chicken salad. And finally, we love chili lime chicken salad without a dressing because all the natural flavors of the salsa are more than enough for us (and because pesky calories) but if you’d like a little somethin’ extra to drizzle on top, you can double the ingredients for the marinade and save half for drizzling purposes before you marinate the chicken in the rest. 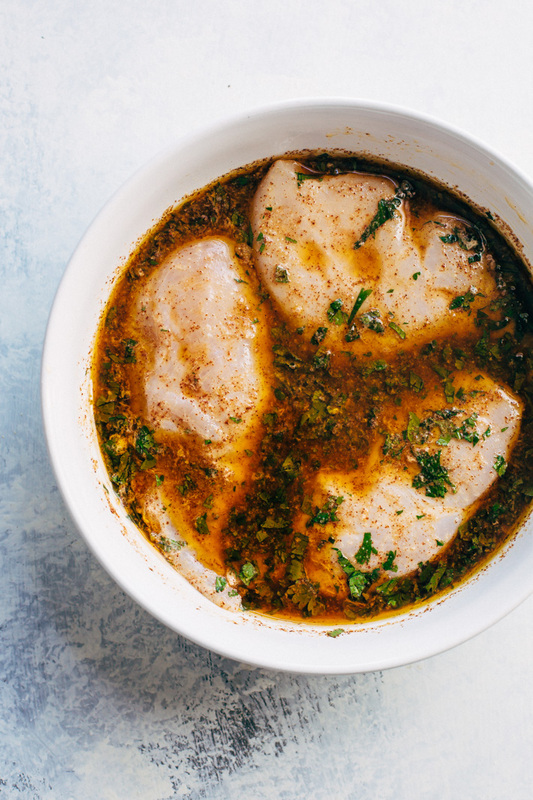 Chicken: Combine ¼ cup lime juice, olive oil, garlic powder, salt, chili powder, and 1 tablespoon cilantro in a bowl and stir. Add the chicken breasts and allow to marinate for at least 15 minutes and up to 30 minutes. While the chicken is marinating, prepare the mango avocado salsa. Heat a large skillet over medium high heat, remove chicken from marinade and cook the chicken for 7-11 minutes or until the chicken breast just gently springs back. Remove to a cutting board, let rest for at least 10 minute before dicing. Add the bell peppers to the pan and sauté for just a minute so the flavors left behind by the chicken get picked up, remove to a plate. 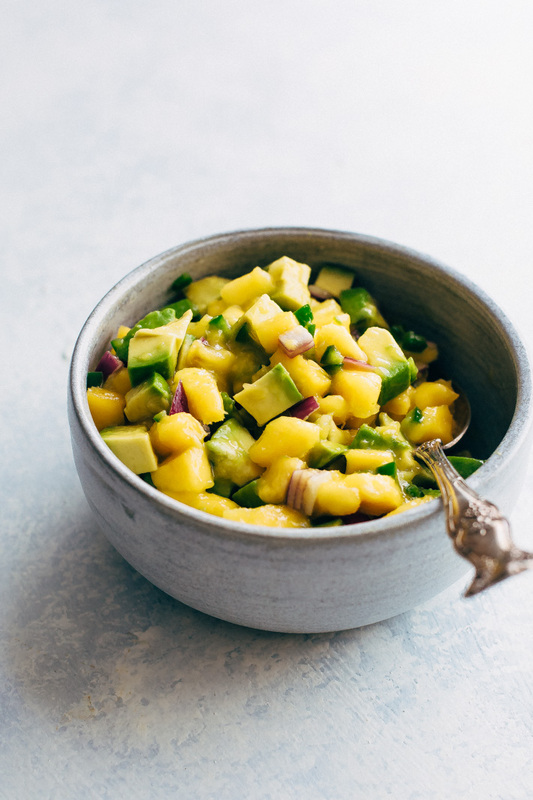 Mango salsa: Add the diced mangoes, avocados, red onions, jalapeños, 3 tablespoons of chopped cilantro, and 2 tablespoons of lime juice to a bowl. Season with a big pinch of salt and stir to combine. Assemble: Place the chopped lettuce in a large bowl, top with the salsa, grilled peppers, and diced chicken. Serve immediately. You can also make and keep the components separately until ready to serve. We didn’t need dressing for this salad as the salsa was plenty for us, if you’d like something to drizzle on top, consider doubling the marinade and saving ½ before marinating the chicken. This can be used as a dressing at the end!